1. Quick meal storage: Keep those healthy meals and snacks within reach in your refrigerator. Store sliced vegetables and fruit in sandwich bags for easy access. Use sectioned containers to help balance your meals. Store boiled eggs to save time at breakfast, and speed up dinner prep by freezing extra portions. Tip: Put the healthier foods at eye level, so you see them first. 2. Add in vegetables: Use an immersion blender to add more vegetables to your sauces and stews. 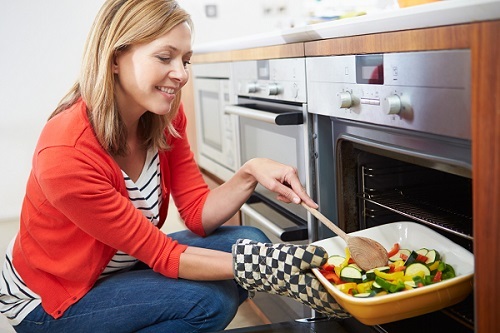 Bake vegetables in your oven at a high temperature to caramelize them and make them more palatable for picky eaters. Tip: An immersion blender can help you smooth out sauces for eaters who are sensitive to texture. 3. Clean teeth: After you polish off those healthy meals, take advantage of an electric toothbrush to clean your teeth. Electric toothbrushes can be especially helpful for individuals with mobility issues, and for children who may lack the dexterity for effective brushing. Tip: Spend 30 seconds brushing each quadrant of your teeth for a full two minutes. 4. Cleaner air: A room air cleaner can reduce the amount of common allergens like tobacco smoke, dust and pollen in your home. Room air cleaners certified through AHAM’s certification program are tested for their ability to remove all three of those. Look for the Clean Air Delivery Rate (CADR) on the label—the higher the number, the faster the air cleaner filters the air. Tip: Choose an air cleaner that’s appropriate for the size of the room in which it will be used. 5. Take the might out of mites: The Asthma and Allergy Foundation of America says dust mites “may be the most common trigger of year-round allergies and asthma,” causing symptoms like sneezing, stuffy nose, itchy eyes and a cough. Washing linens and rugs in hot water can kill mites, a dehumidifier can reduce the humidity that helps them thrive, and a vacuum with a HEPA filter can help remove them from your home’s hard surfaces. Tip: Have someone who doesn’t suffer from allergies do the vacuuming.